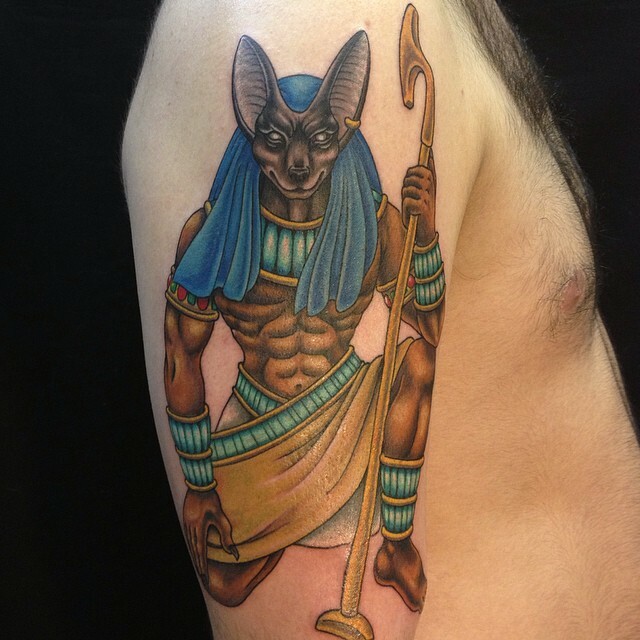 There are different types of tattoos that you can opt for and one of them is the Egyptian tattoo. These tattoos are made with from different symbols and they take a different meaning altogether. Here is a look at the Egyptian tattoos, along with their meaning. 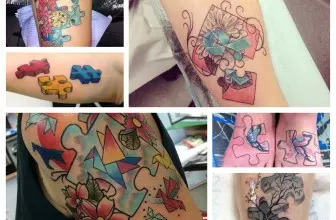 These tattoos are among the original concepts of tattoos. The Egyptian symbols were designed out of vital images of the Egyptians. Many years ago, the tattoos were not used for fashion, like they are used currently. The original history of tattooing started and they had specific symbols drawn on their skin. The mummies that were preserved were studied and realized to have tattoos. The most common people that applied tattoos in the ancient Egypt were ladies, since the tattoos played a specific role. The designs of the ancient tattoos were similar to the traditional, North African and the Western Asian cultures. These tattoos had different meanings altogether. In the Ancient Egypt, the women wore the tattoos with varied reasons. Some were applied as a mark of whores or they helped to protect the woman from STDs. However, they were also worn as a sign of spiritual connection. It played the form of an amulet when the woman was having difficulty when delivering a baby. This tattoo was applied around the abdomen, on the breasts and on top of the thighs. When the woman is pregnant, the pattern would stretch in a way of protecting the woman. Some symbols like Bes, were placed over the thigh to safeguard the birth process and ensure that the woman delivers safely. It was believed that Bes would protect the woman when in labor. It was basically supposed to be placed over the thigh. This is the reason why the tattoos were mostly worn by women. In the modern era, the tattoos came with a new wave, having a new meaning. Some of the other meaning of tattoos with Egyptian symbols includes the following. 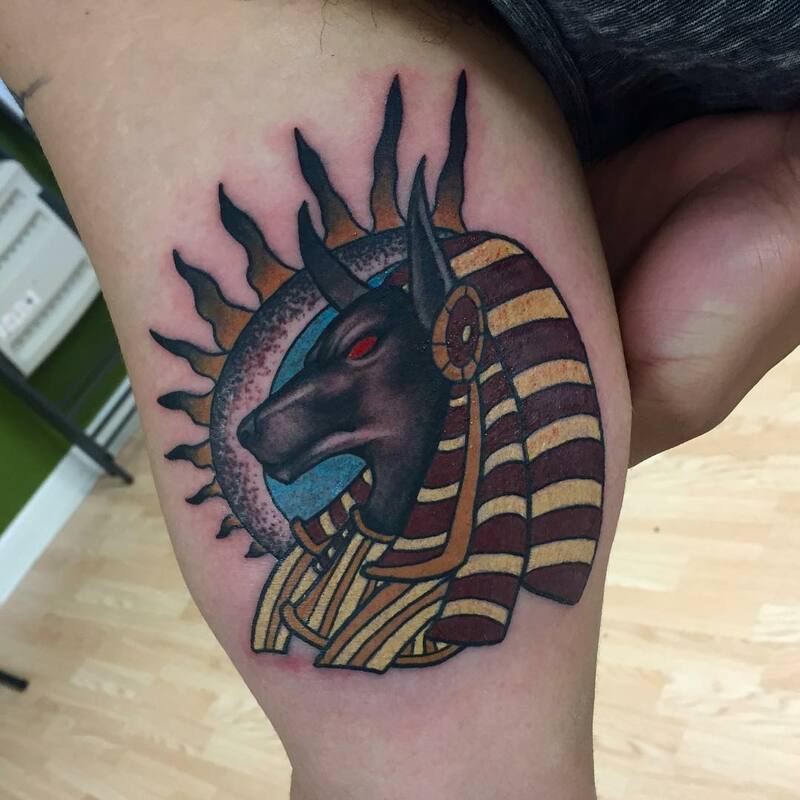 There are some tattoos that have the Egyptian gods, which were used to connect the person to the divine world. They were used as a protection from the gods that have been drawn on the skin. The tattoos are also applied as a sign of sacrifice to a god. The type of god that has been drawn on the skin will be the one that will be commemorated or it would be as a sacrifice to that god. The tattoos were also worn as a talisman, to permanently mark the body and also, the tattoo was used as a medical protection. It also protected the person wearing it from magical powers, depending on the powers of the god that has been drawn. These tattoos are basically designed, on the basis of the common Egyptian symbols that are mostly related to the spiritual world. Here is a look at the common tattoos, along with their meanings. 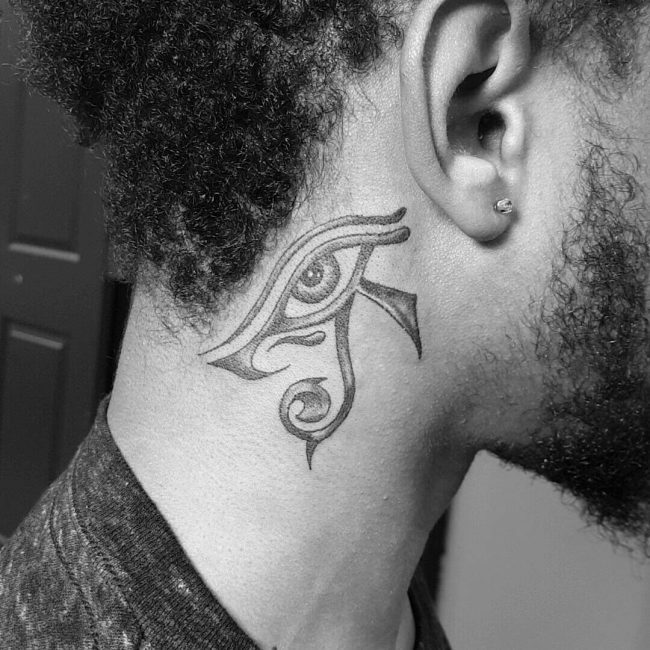 This is almost the most popular Egyptian symbol that is displayed in a tattoo. The Ankh symbolizes the key of life and the Nile. The River Nile was the major dependant of the Egyptians. It is worn in any area of the body. This is also known as the eye of Horus and it is believed to be the all-seeing eye of the god of the Sky. Horus lost his eye in the event of a war and it was discovered elsewhere. This symbol is used in tattoos and people believe that it offers protection. Others believe that it has some healing power. Another name for this symbol is the eye of Ra. This is a cat goddess that is mostly applied by the cat lovers. It is not clear about its meaning, but it is mostly applied on the upper arm, then the tail curls around the arm with style. The Pharaoh was the king of ancient Egypt and this was just a name that was given to different kings that were king at a particular period. Nonetheless, the original and the first Pharaoh of the land is the one that will appear in most images and symbols. The tattoo of the Pharaoh is applied by a number of people and it will be mostly applied all over the back, to take the entire image. 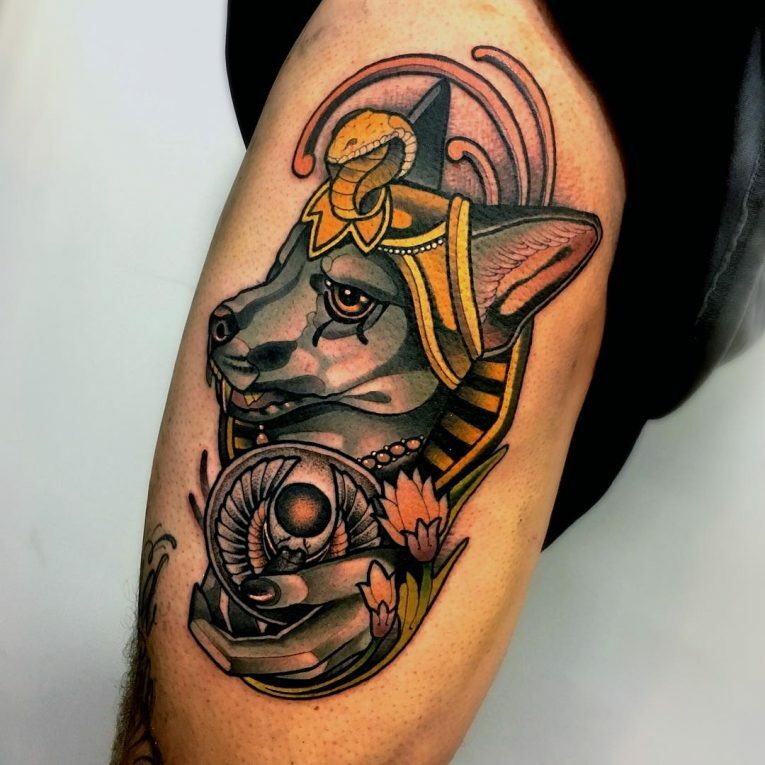 There are also some tattoos that are applied, with regard to the Egyptian gods, though the majority of them are Hindu lords. Ra is the believed to be the most powerful of all the gods and he will be drawn with many other symbols that have hidden meanings. The tattoos will be a blend of gods and goddesses, which carry different meaning altogether. This is another popular symbol that is highly valued by the Egyptians. 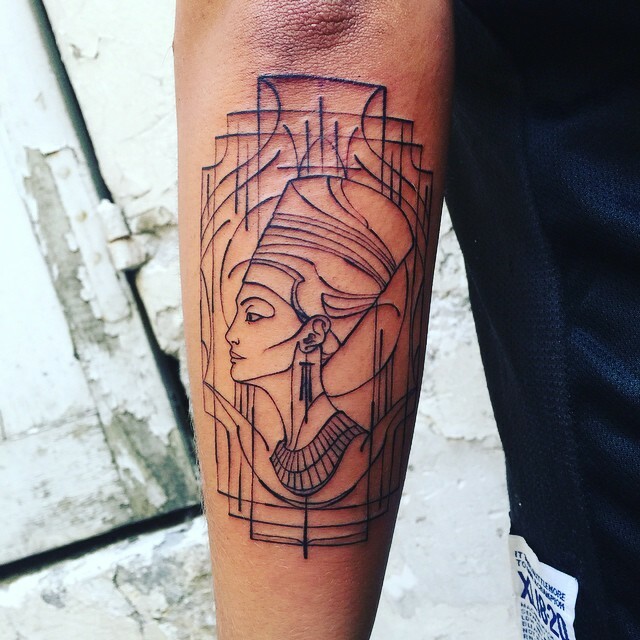 It is not common as a tattoo, but very popular in the Egyptian culture. This is a statue that has been made of a huge stone. The statue has the face of a man, with a lion’s body. It is believed to protect the popular pyramids in Egypt. It entails a lot of process when making it, which means that it will need a professional to draw it. This is a dung beetle that is a sign of spontaneity and rebirth. It is mostly applied at the back of the neck and at the hip. The tattoo can also fit comfortably on the wrist, but it needs a professional, especially if you will need to have it colored. This is also a popular symbol that is basically a dog headed man, who was a god of the dead and also believed to offer protection. It is believed that he watched over those that have died, to protect them. It would fit in the back and many believe that he offers protection. Before you can apply any tattoo, you must know what it means and you must choose a professional, who would draw it as expected. Knowing the meaning of the tattoo will help you wear it comfortably, especially if it is open to the public.